What's the right way of removing CocoaPods from a project? I want to remove the whole CocoaPod. Due to some limitations imposed by my client I can't use it. I need to have just one xcodeproj instead of an xcworkspace. Removing CocoaPods from a project is possible, but not currently automated by the CLI. 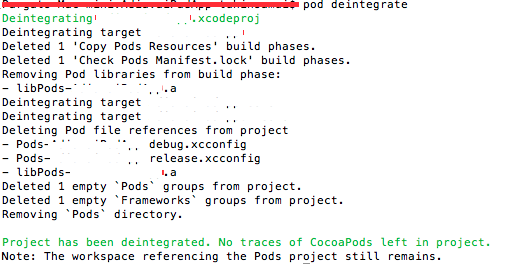 First thing, if the only issue you have is not being able to use an xcworkspace you can use CocoaPods with just xcodeprojs by using the --no-integrate flag which will produce the Pods.xcodeproj but not a workspace. Then you can add this xcodeproj as a subproject to your main xcodeproj. NOTE editing some of these things if done incorrectly could break your main project. I strongly encourage you to check your projects into source control just in case. Also these instructions are for CocoaPods version 0.39.0, they could change with new versions. Under your Build Phases delete the Copy Pods Resources, Embed Pods Frameworks and Check Pods Manifest.lock phases. This may seem obvious but you'll need to integrate the 3rd party libraries some other way or remove references to them from your code. After those steps you should be set with a single xcodeproj that existed before you integrated CocoaPods. If I missed anything let me know and I will edit this. Also we're always looking for suggestions for how to improve CocoaPods so if you have an issues please submit them in our issue tracker so we can come up with a way to fix them! As shown by Jack Wu in the comments there is a third party CocoaPods plugin that can automate these steps for you. It can be found here. Note that it is a third party plugin and might not always be updated when CocoaPods is. Also note that it is made by a CocoaPods core team member so that problem won't be a problem. pod deintegrate and pod clean are two designated commands to remove CocoaPod from your project/repo. Use this following command on your terminal to install it. First of all goto your project folder by using the as usual command like..
Now use those two plugins to remove it completely as follows..
Use this following command on your terminal to deintegrate the pods from your project first. After deintegration of pod from your project use this following command on your terminal to clean it completely. After completing the above tasks there should be the Podfile still remaining on your project directory..Just delete that manually or use this following command on the terminal..
Thats it...Now you have your project free from pods...Cleaned. Removing Cocoapods from the system. Any way try to use the following command on your terminal to uninstall/remove the coca-pods from your system. It will remove the coca-pods automatically. I think there's a more easy way to do that. As edited by the accepted answer, now you can use a third party plugin cocoapods-deintegrate, it's reliable because its made by a CocoaPods core team member. You could remove them from your project manually，but there's also another tool for helping you to clean them, thanks cocoapods-clean. Before removing you should ensure you have a backup of your project! After this cmd, no traces of Cocoapods left in your project. Then you can use your project again. It's like it needs to remove all the pod scripts from your build phases and re-add them back in for it to work, at least in my case. Under Build Phases delete Embed Pods Frameworks phase. There can be two aspects developer may face. developer wants to uninstall particular framework from project from pods. In first case you have to use 'pod deintegrate' and follow several steps which are mentioned in the answers above. For second case that is if you want to uninstall any particular framework which is installed there very simple way available in your pod file just comment the framework which you want to uninstall and run pod install command. Here I want to uninstall facebook and parse frameworks (which were installed using pods) and not iCarousel that is why I have updated my pod file like above. Now if I run pod install it will keep iCarousel as it is in my project and will remove facebook and parse. The first thing that you will need to do is remove the Podfile, Podfile.lock, the Pods folder, and the generated workspace. Next, in the .xcodeproj, remove the references to the Pods.xcconfig files and the libPods.a file. Within the Build Phases project tab, delete the Check Pods Manifest.lock section (open), Copy Pods Resources section (bottom) and Embed Pod Resources(bottom). The only thing you may want to do is include some of the libraries that you were using before. You can do this by simply draging whatever folders where in the pods folders into your project (I prefer to put them into my Supporting Files folder). How to "Delete derived data" in Xcode6? I am gonna write what iv done very briefly (to delete any CocoaPods from my project).. Note that this method will also pull any updates to the other pods in your podfile. You may or may not want that. Delete all related pod file. How to improve cocoapods: build a GUI and forget this command line craziness. We are not in 1974 anymore. Not the answer you're looking for? Browse other questions tagged xcode cocoapods or ask your own question. iOS - how to get rid of cocoapods if there are already some references in them? What are the complications of introducing cocoapods into a collaborative iOS project?